The client hands you a stack of printed material to digest in the next project. What do you do? The more work you can get done for you, the better you'll be, right? Typing is one chore that really hasn't been innovated. Now, OCRWizard 4.0, optical character recognition (OCR) and PDF document conversion application for macOS could relieve you of at least some of those chores. OCRWizard converts any PDF, scanned documents, or image files (including the picture of business card) into searchable PDF, Word, Pages, HTML, Excel, Keynote, and ePub, etc. on Mac. I'm excited to release OCRWizard for Mac users ... Individual and business users can incorporate the easy-to-use, high-performance OCR app into their business workflows to increase efficiency. Accurate OCR engine: The build in OCR engine gives users maximum control over the text recognition. 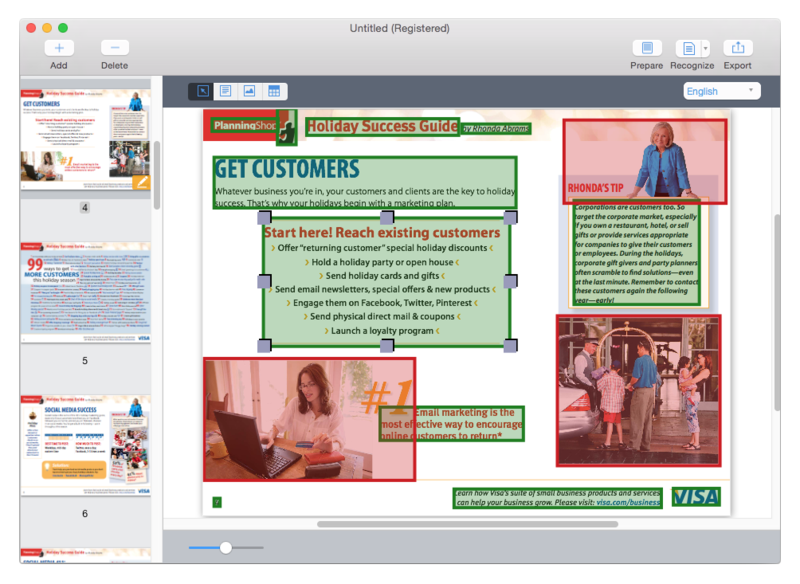 It automatically marks every part of a loaded PDF or image in different color. To get specified results users can do a more delicate handwork on PDF or image files with 4 options: Select, Mark Texts, Mark Images, and Mark Tables. Flexible output formats support: Supports converting PDF, scanned documents, or image files to document formats (PDF, RTFD, DOCX, DOC, XLSX, PPTX, HTML, TEXT, ALTO, FB2, EPUB, ODT, PAGES and KEYNOTE) and image formats (JPG, PNG, GIF, BMP, and TIFF). OCR with 49 languages: Supports recognize text in 49 languages, including English, French, Italian, Chinese, German, Russian, Czech, Turkish, Portuguese, Polish, Romanian, etc. Document and business card recognition mode: Cisdem OCRWizard also includes document and business card recognition support which enables customers to instantly convert PDF or collect contact data from a business card and export extracted data to Vcard or CSV, or directly add to your Contacts, Mail, Messages and AirDrop. Handy image and file processing: Cisdem OCRWizard can help correct image and file distortions (rotate, crop, invert, adjust brightness, sharpness, contrast and saturation, etc.) and convert into a wide range of formats. Fully supports macOS Sierra: OCRWizard is designed with easy to use in mind; Numerous features like full-screen support, drag-and-drop functionality and easy deleting, rotating, etc. are implemented in a intuitive interface that will be clear for any macOS Sierra user. Pricing and Availability: OCRWizard 4.0 is available now through the Cisdem website. A trial version available on the site also allows any user without a license to have a try with the App. A Single License of OCRWizard is available for $59.99; License for 2 Macs of OCRWizard is available for $79.99, while License for 5 Macs costs $119.99 (USD). To get more information and obtain a free trial version, please visit Cisdem official website. Madelia, Minnesota - Cisdem provides productivity and business software that helps Mac users to get their job done faster. Cisdem products include top rated software centered on PDF Conversion, PDF Management, Data Recovery, and File Management. The company is dedicated in building highly efficient Mac software that make life easier and processes simpler. All Material and Software (C) Copyright 2016 Cisdem. All Rights Reserved. Apple, the Apple logo, macOS and Macintosh are registered trademarks of Apple Inc. in the U.S. and/or other countries. Other trademarks and registered trademarks may be the property of their respective owners.